Certainly, I don’t mean to be ungrateful: Many things are good. Very good. But I can’t help thinking that they’d be close to perfect if a particular plant had come into bloom just a few days earlier or stayed a few days longer, or that we’d have more fall color now if the last two weeks had been properly Octobery instead of August-like. And I don’t think that’s truly being whiny or hard to please; it’s just part of what makes gardening so interesting. I cherish those few moments each year when I look around and think “Wow, this is amazing.” But if they started happening too often, then there’d be nothing to left to do, and I’d have to find a new hobby. Fortunately, I don’t see that happening any time soon. All of my favorite things about fall gardening have happened (or will happen), after all, even if the timing didn’t quite work out as it often does. 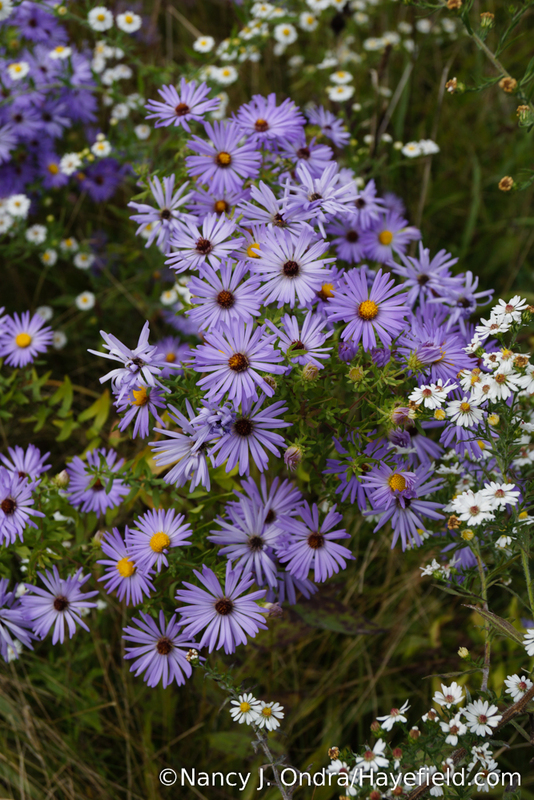 The asters certainly were glorious, though the New England asters (Symphyotrichum novae-angliae) fizzled out sooner than usual in the hot and suddenly dry conditions in the last month. New England asters (Symphyotrichum novae-angliae): I started with purple ‘Hella Lacy’ and ‘Harrington’s Pink’ many years ago, and the resulting offspring look pretty much identical. The great thing about having many kinds of asters is that at least one or two are likely to thrive no matter what the weather. The aromatic aster (Symphyotrichum oblongifolium), for instance, enjoyed the steady moisture we had earlier this year but hasn’t seemed to mind the more recent dry conditions at all. 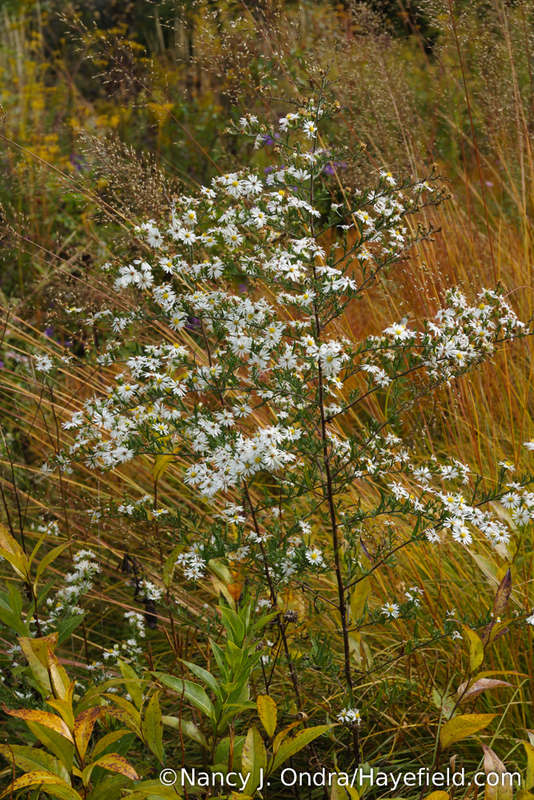 And if nothing else, there are the “LWAs” (little white asters): mostly heath aster (Symphyotrichum ericoides) and frost aster (S. pilosum) here. I never planted any in the garden; they just blew in from the meadow. They seed around freely, so I pull out as many as I can find each spring, but I always manage to miss some–thank goodness. Though asters are the most abundant bloomers around here right now, they’re not the only floral gems this time of year. 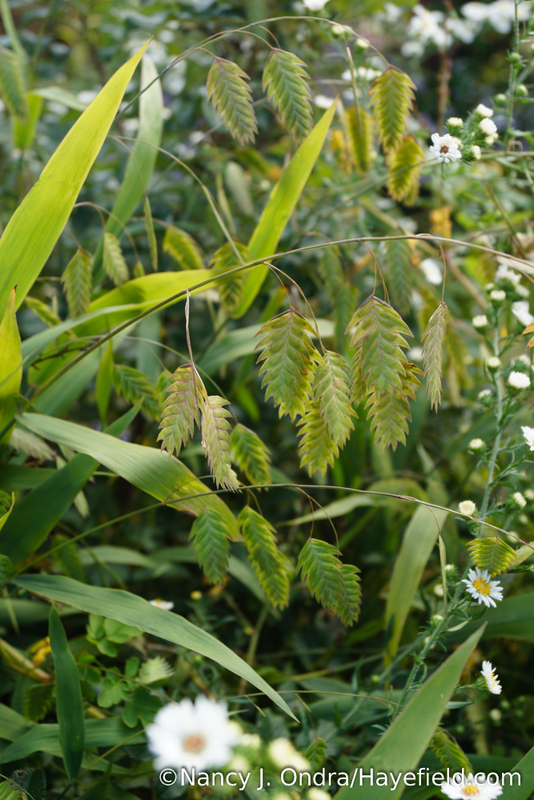 I finally found a way to keep 8-foot-tall ‘Dali Marble’ burnet (Sanguisorba) from sprawling: let it grow up through ‘Flying Dragon’ hardy orange (Poncirus trifoliata). One thing to be happy about with this warmer-than-usual fall is that we haven’t had frost yet, and it doesn’t look like we’ll get any in the near future. 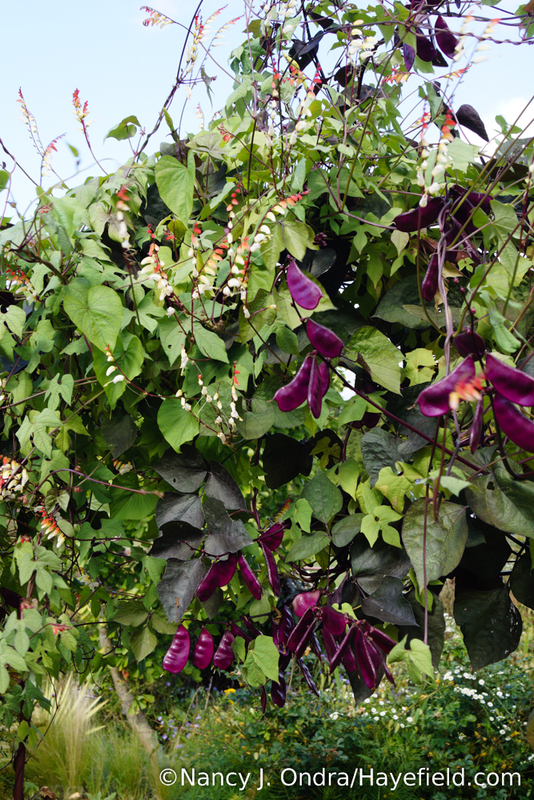 That’s great for late-ripening seeds, and for many annual vines, which didn’t really take off until the end of September. Euphorbia palustris ‘Zauberflote’: cut back to about 2 inches in August, this pretty perennial often flowers again in fall. 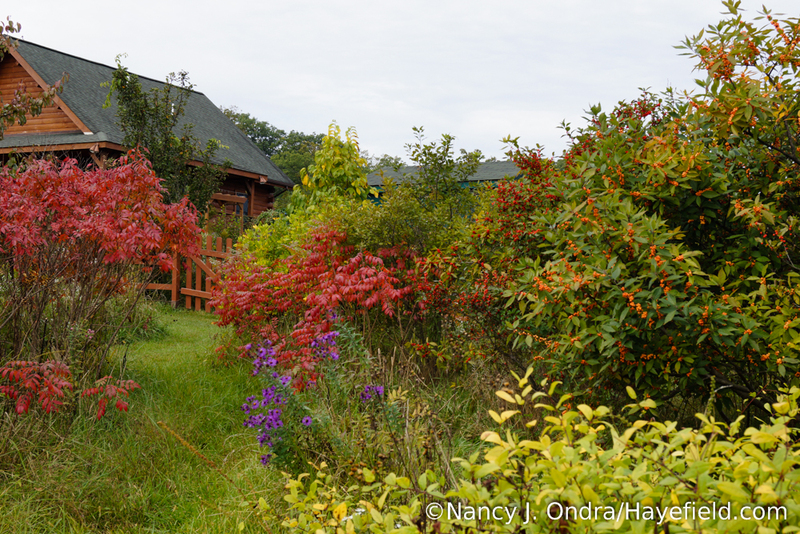 Nothing says “fall” like forsythia, right? 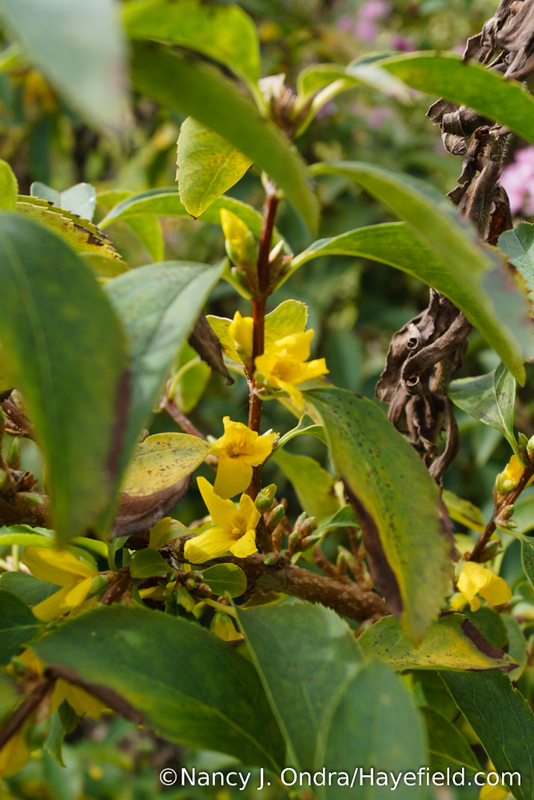 Eh, maybe not, but it’s not unusual for ‘Kumson’ greenstem forsythia (Forsythia viridissima var. 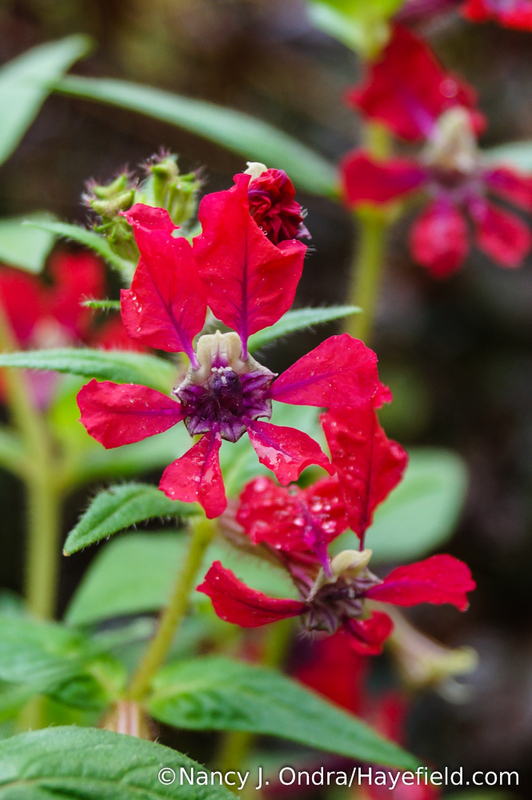 koreana) to flower in autumn as well as spring. 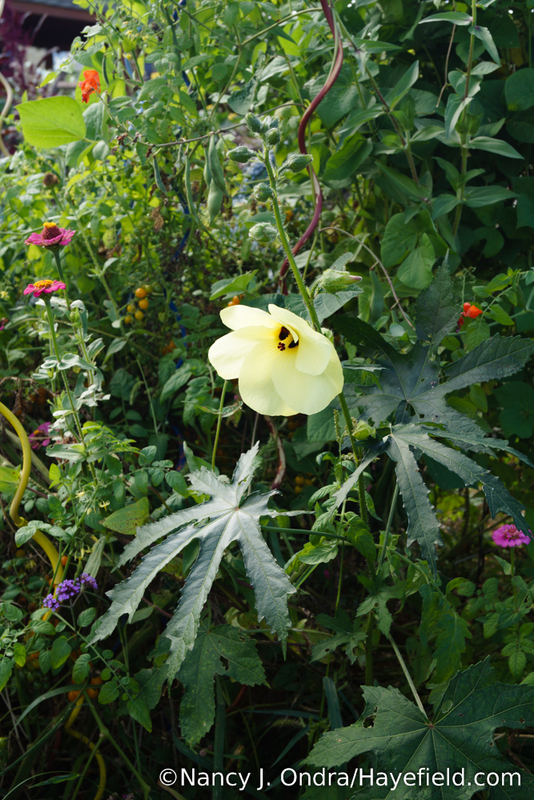 I have no idea how this sunset hibiscus (Abelmoschus manihot) ended up in the vegetable garden, as I haven’t grown it for quite a few years. I’m thrilled to have it, though, and I hope it has time to ripen some seeds. 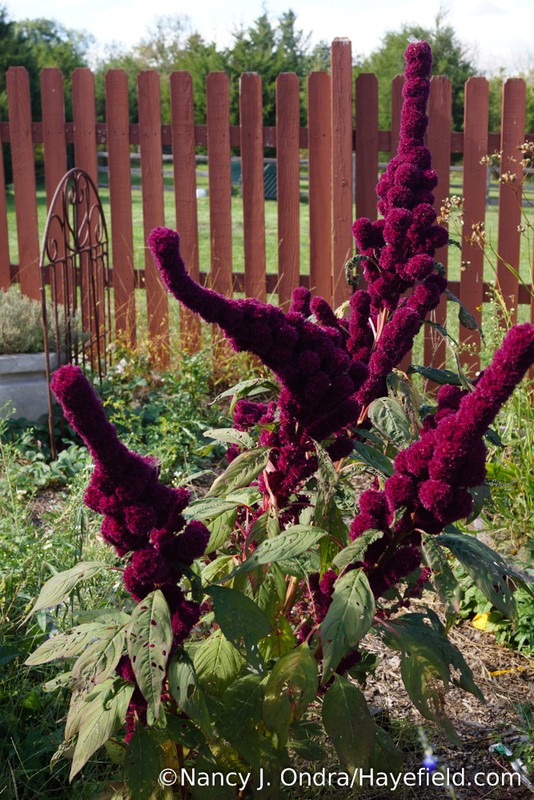 I didn’t plant this clump of ‘Elephant Head’ amaranth (Amaranthus) either, but it too is welcome. What a silly-looking plant it is. Technically, this seven-sons tree (Heptacodium miconioides) isn’t in flower right now. The white blooms dropped off a week or two ago, leaving the rosy pink calyces, which are just as pretty–in this photo, at least. In this wider shot, it’s obvious that there are a lot of dying branches on the top half of this tree. I’ve seen dieback on many seven-sons trees (Heptacodium miconioides) around here, but this one — one of the first trees I ever planted, back in the early 90s — has been healthy-looking and vigorous for many years, until this fall. Uh oh. A closer look reveals some bad signs on this seven-sons tree (Heptacodium miconioides): a sticky black canker as well as what looks like some spotty white fungus. Poor tree. 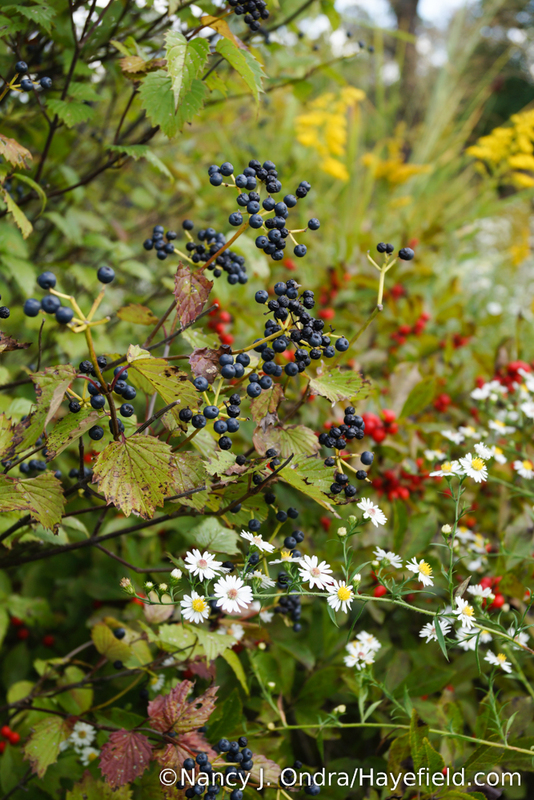 Back to happier things, like the beautiful fruits and showy seedheads that add so much interest to the fall garden. 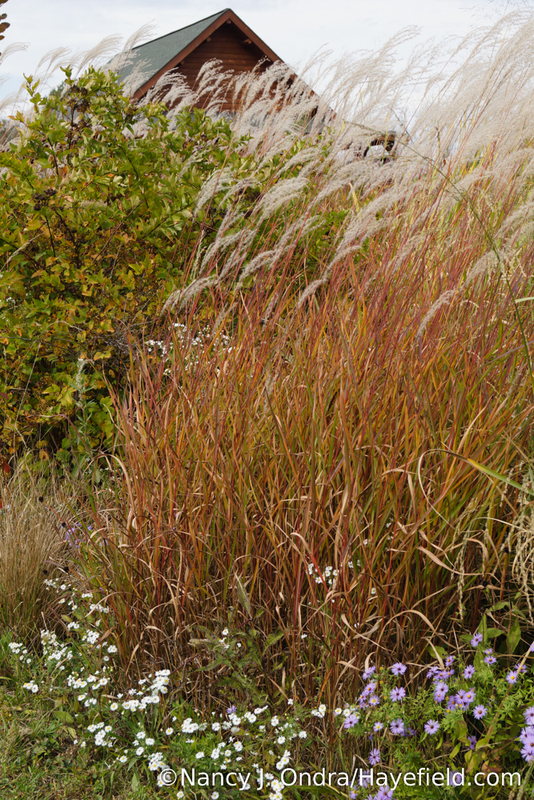 Speaking of grasses…the plants we normally think of as ornamental grasses can also be key players this time of year. Fall foliage color is the main ingredient missing in this year’s October Bloom Day, though a few bits of it are finally starting to appear. 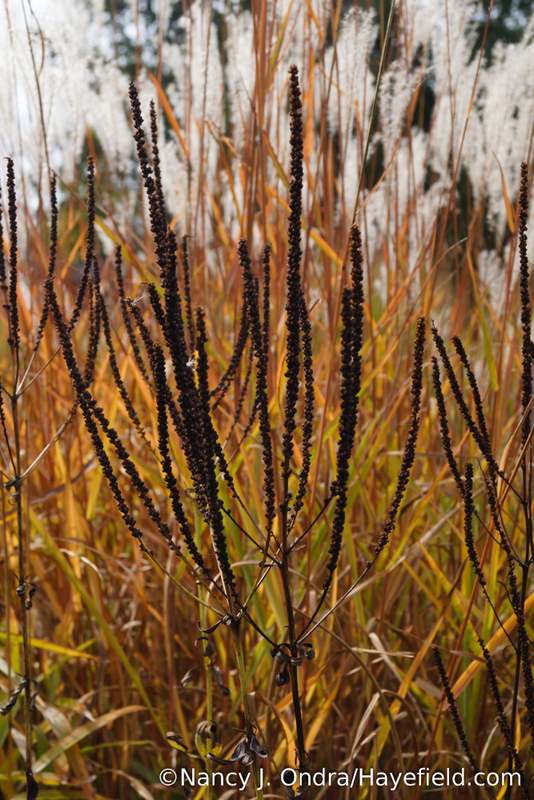 Putting it all together makes for some lovely effects in the autumn garden. So yeah, it’s all good out there in the garden, even it’s not quite the conflagration I’d been banking on. To be fair, I have other things on my mind right now. 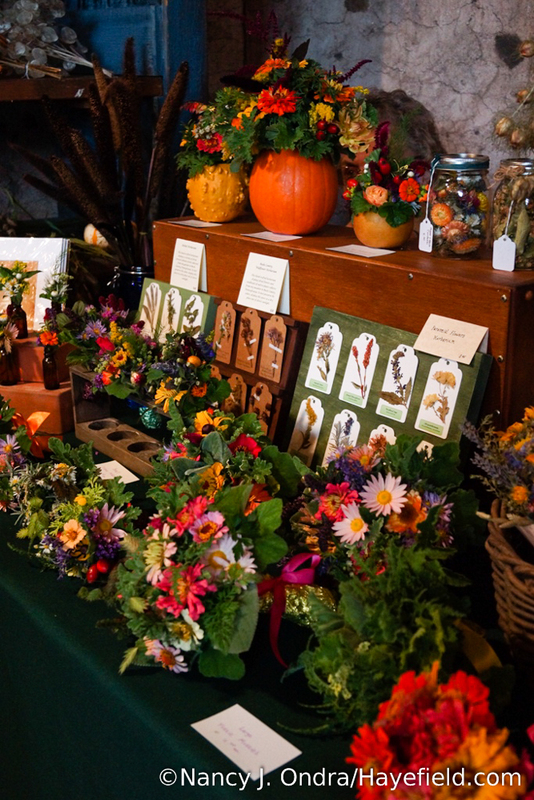 One was yesterday’s Fall Festival at Linden Hill Gardens in Ottsville, PA. 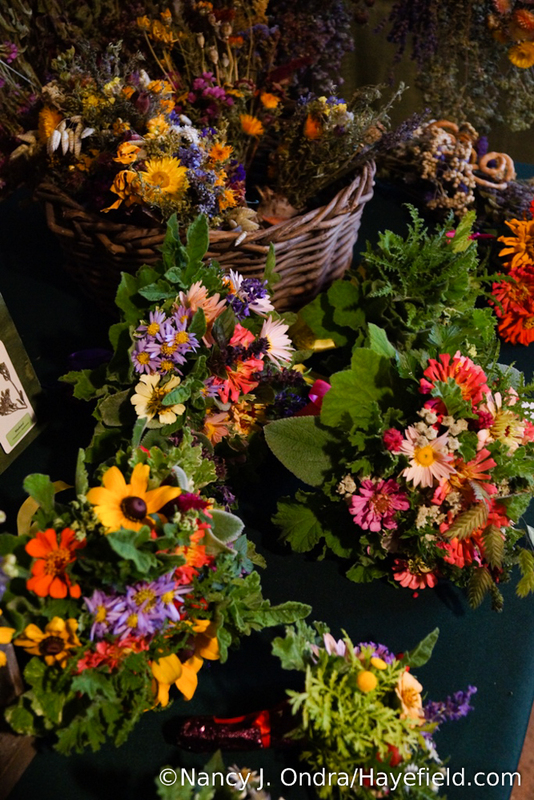 It was a great excuse to spend a few days playing with my flowers and herbs to make fresh and dried arrangements for sale. Also, as I mentioned earlier, it’s been a terrific year for seeds, and I’ve been collecting pretty much anything I can get my hands on. 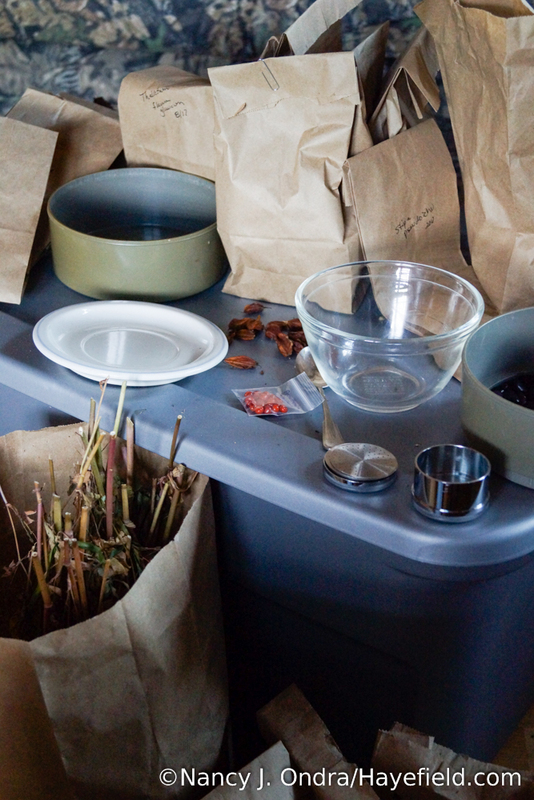 Over the past few weeks, I’ve been tackling boxes and piles of paper bags filled with roughly collected seeds, gradually getting them cleaned and reduced to small packets of seedy goodness. 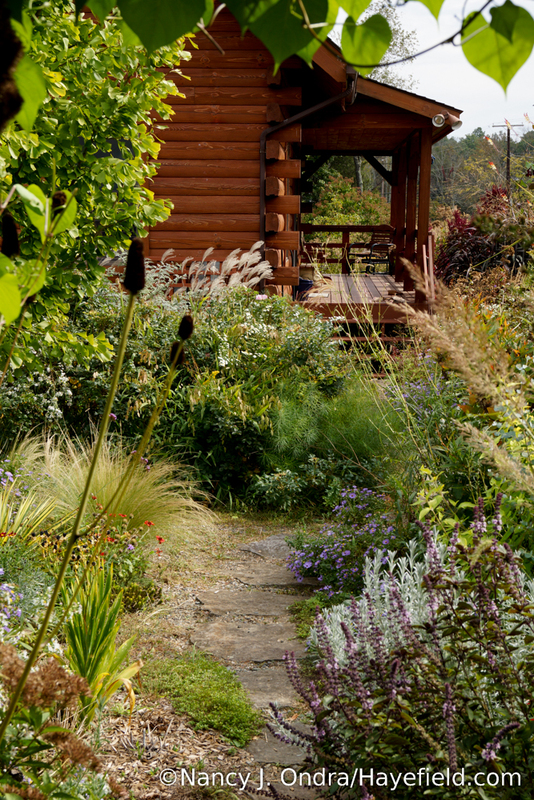 Who wouldn’t feel rich with their own little seed library? Hoarding these treasures is fun; sharing them is even better. 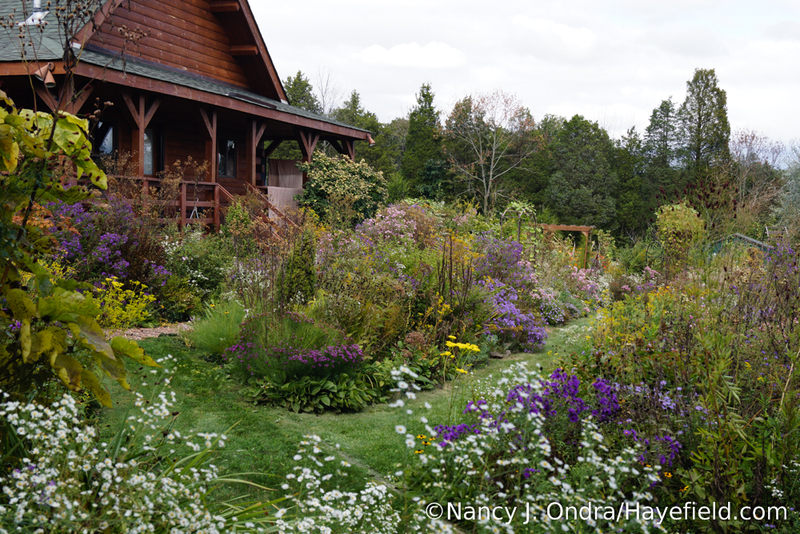 In the meantime, be sure to visit the other participants in this month’s Garden Bloggers’ Bloom Day, so you can explore what’s going on in gardens around the world right now. 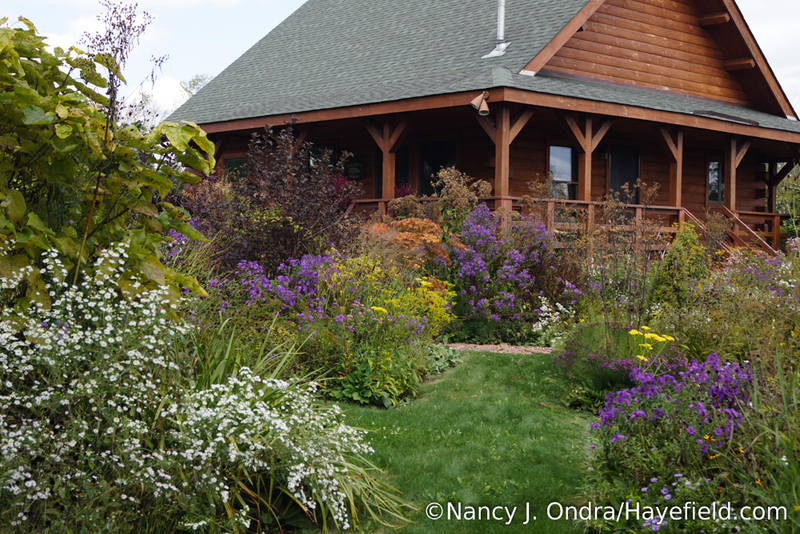 You can find the list at Carol’s main GBBD post at May Dreams Gardens. I can’t finish without a hello to my boy Duncan, who turned 15 years young this week. Happy birthday, Fuzzy Bear! I love your gardening style. It makes me feel good just enjoying it through your photos! Thank you! Good morning, Susan, and thank *you* for the lovely comment. I truly appreciate you taking the time to visit. I’m sending happy thoughts to you and your garden today! 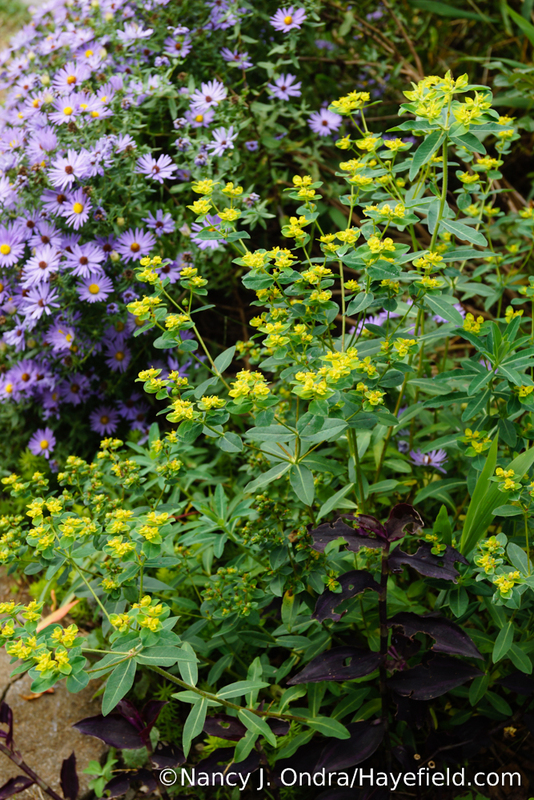 Looking through your photos this month, the two “must haves” that stood out for me were the asters and the patrinia. I introduced one patrinia to my garden this year but will have to wait till next year for blooms. From your wonderful plant combinations, It is clear that I need to add more! 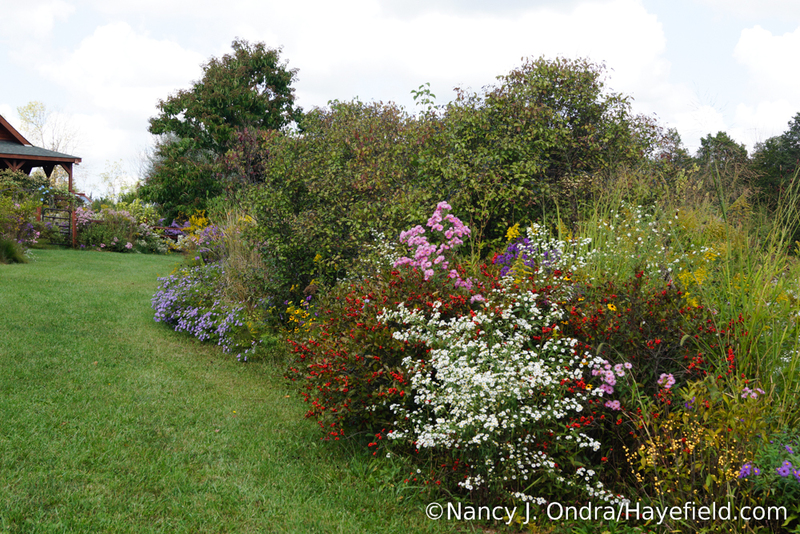 I also added several varieties of aster but the deer decided I didn’t need to enjoy the blooms. Drat! I thought they were resistant to deer! If you saw my garden this year, it would be obvious that I am enjoying the celosia mega punk seeds you shared with me two years ago. 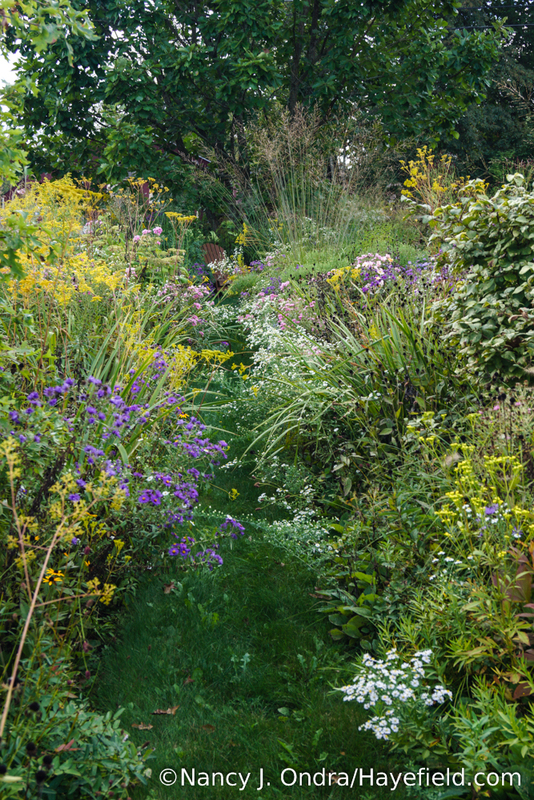 I spread last year’s saved seeds throughout my gardens with wild abandon and they did a wonderful job of filling in the gaps in my young garden. Next year, the Ray’s golden campion will be adding more of a presence to the show because I scattered this year’s seeds around. My garden is attracting a lot of attention in the neighborhood. People tell me they purposely plan their walking and driving routes so they can pass by. This does present some awkward moments because I often walk outside in my bathrobe with my cup of tea to grab a few moments of enjoyment. You deserve honorable mention in the compliments I receive because of the inspiration your garden has given me! Hi Debbie! I’m so happy to hear all of the good news from your garden. 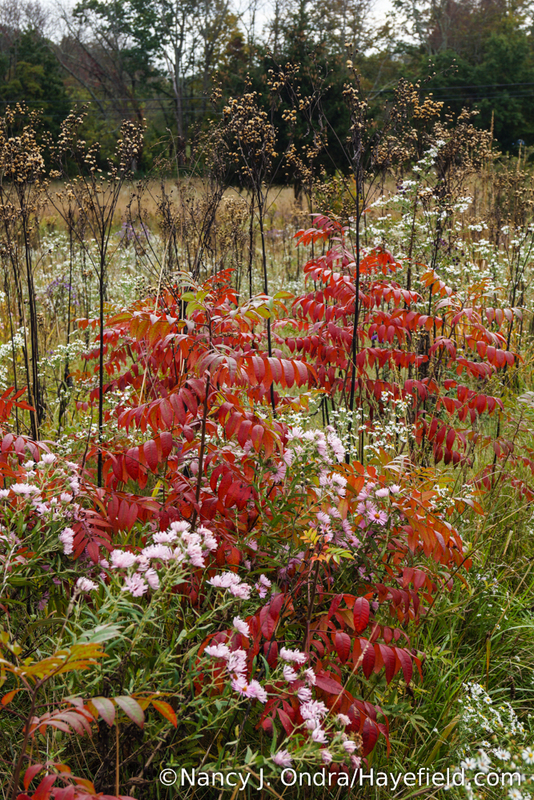 Well, except about the deer, of course–how rotten of them to munch on your asters. The deer around here don’t appear to eat them. Or maybe they do, and I just don’t notice because there are so very many asters all over the place. 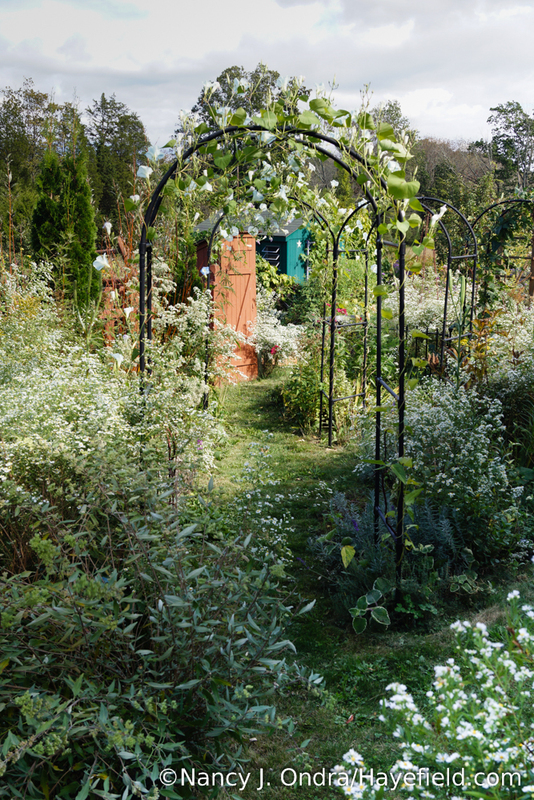 You must feel so good to hear those nice comments from people about your garden. We’ll have to trust that they’re so entranced by your flowers that they don’t even notice you in your robe. Or, if you sit very still, maybe they’ll think you’re some quirky piece of garden art? Anyway, I hope I can tempt you with some new seeds this year. See you next month! It is always a delight to stroll through your garden on the 15th. 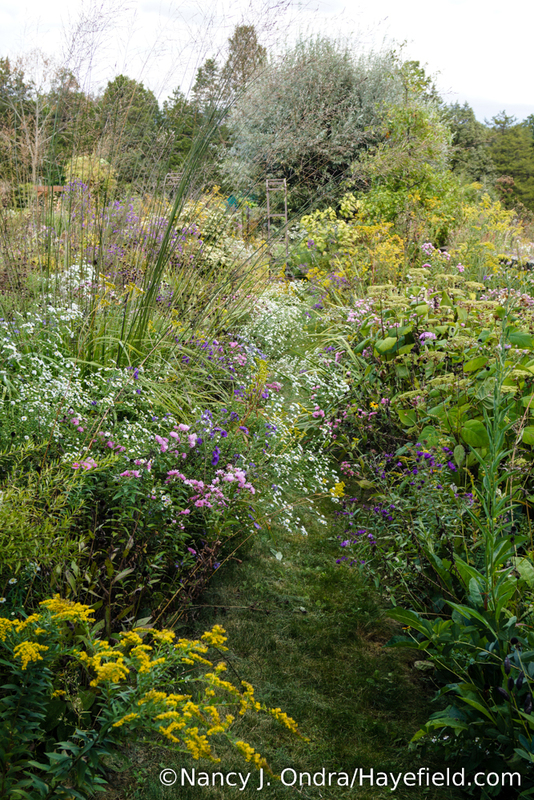 It is at once an inspiration and cause to make me feel like a sluggish gardener. I love the way those white asters pop up here and there. I am always wondering how they get here in my semi suburban garden. 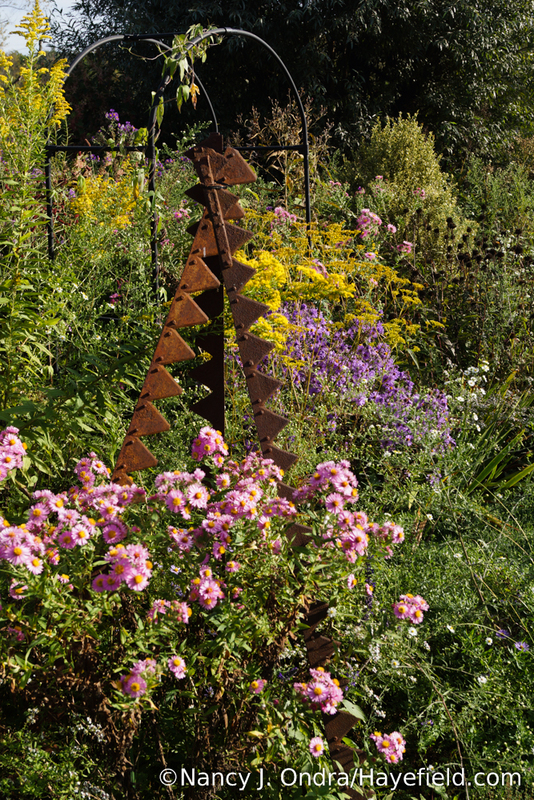 It is so dry here that the asters didn’t last long. How I wish I could pick up a few of your little arrangements and some dried flowers. Sweet. Speaking of sweet, Duncan with those dreamy eyes is a charmer. Happy GBBD. Happy Bloom Day, Lisa! Thanks for stopping by. I have to admit that the garden is making me feel a bit tired too. As much as I’ve enjoyed the long fall, I’m sort of looking forward to having a break for the winter. There’s so much work to be done before then, though; no more time to indulge in playing with flower arrangements until some outdoor stuff gets done. Duncan says hello, by the way! My 3 main thoughts after seeing tonight’s post…. And…I’m left laughing at myself because I’m almost 71 years old and when someone wants to give me this or that, or go shopping and I have to say that those things are really not important to me, There’s nothing that I need (live in my jeans and sweats and Crocs) and I’m not interested in ‘acquiring’ at this stage of the game…..lol…then I see all of the plants that I really do need to have…. Love and kisses and birthday wishes…to Duncan ! Bloom Day greetings to my fellow grasses fanatic! It’s a great time of year for us, isn’t it? And I know what you mean about not wanting to acquire more things. But plants are different than other stuff: You don’t so much own them as agree to be owned (or rejected) by them. Kind of the same with our companion animals, except that they don’t really have a choice about where they live; they just have to deal with it. If a plant doesn’t want to be somewhere, it just doesn’t grow–or it grows so poorly that you wish it wouldn’t grow at all. Ah, well. Speaking of companion animals (a happy one, I hope), Duncan says thanks, Sherry! Oh ho, so *you’re* the one who’s been getting our rain for the last month. I hope it didn’t spoil your fall season. 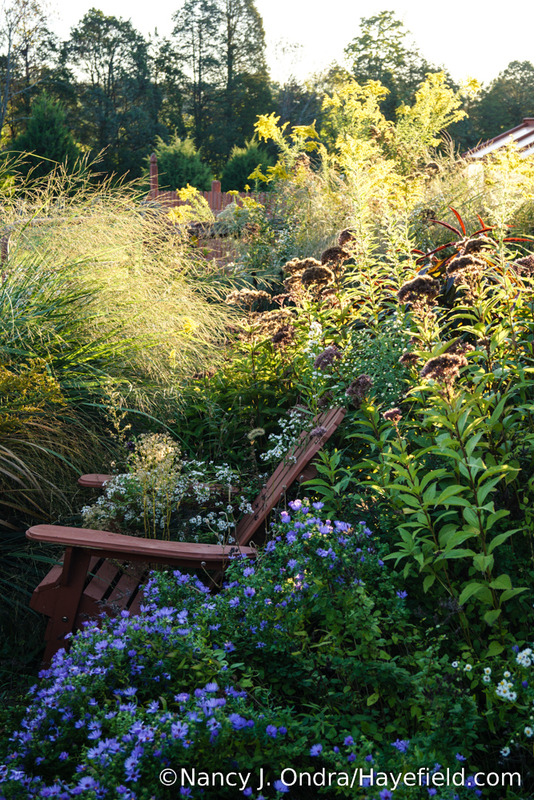 The warmth should be good for your Panicum, anyway, though it would probably appreciate a good dose of sun too. It was good to hear from you, Allan, and Dunc says thank you. Until next month…! Beautiful, despite the weird vagaries of your weather, which we have also experienced in the far south east of the UK this year. A warm, windy but grey Summer with barely a calm day. Lots of rain days but barely any real rainfall. Autumn started at the end of August, most of the garden trees started to loose their leaves in September and some are already bare, which normally doesn’t happen until middle of November. 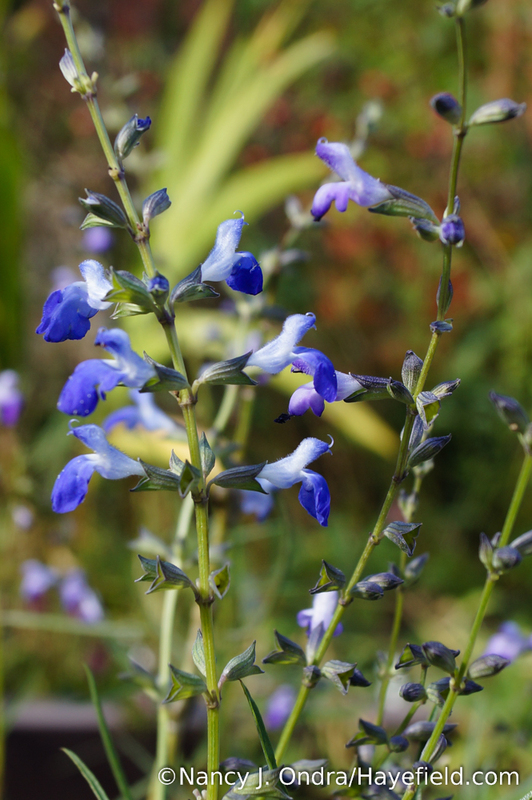 Many plants’ flowering seasons were abnormally short. It has been very odd. 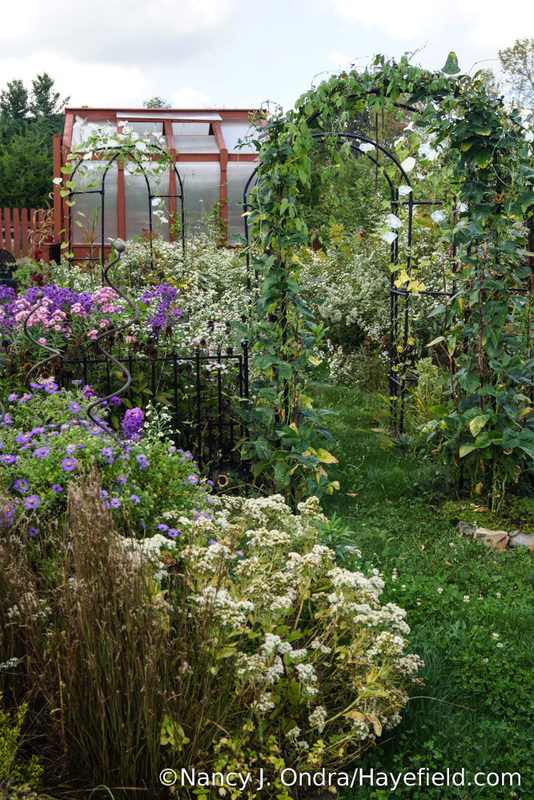 Your garden still looks wonderful, but like many gardeners that moment where one can say “Wow, everything looks great!” are few and far between. We are all to often over-critical of our own patch when others still see the beauty where we can’t. Like that rogue volunteer cherry tomato that self seeded in my “blue border” that grew to 10 feet across before I had the heart to yank it out, Everyone else thought it was nice and attractive. Oh well such is a garden creator’s life. Am I the only one that cannot abide asters whatever their current taxonomy? I find them blousey, overbearing and inelegant. 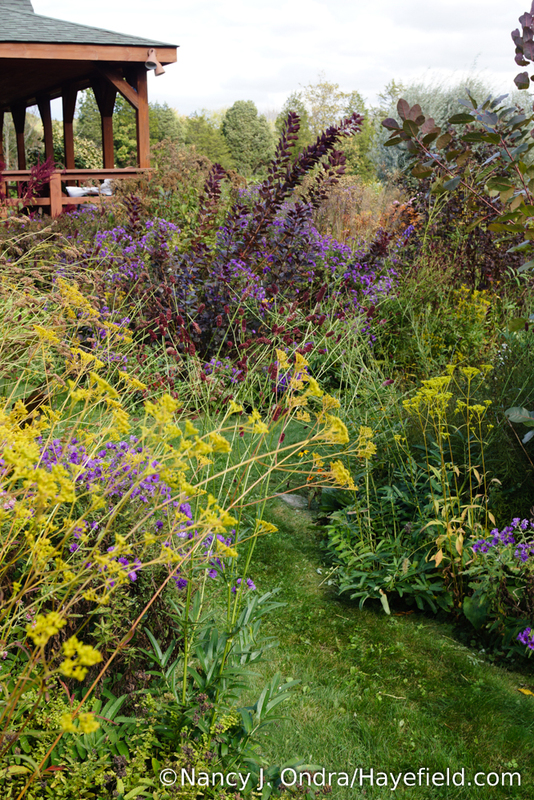 Thank goodness for dahlias, rudbeckia hirta, actea and salvia for contemporary alternatives. And I love your photo of the chair in your courtyard garden. Perfection. Thanks, Nick. It’s fascinating to me that “normal” people can be so oblivious to even the current day’s weather while we gardeners can recount in excruciating detail what we’ve had to deal with over the entire growing season. I really thought it was heaven getting a nice amount of rain every few days through the summer, so that no watering was necessary, but even that seemingly perfect gardening weather turned out to be less than ideal in the long run. (Never mind, lads, same time tomorrow. Must get a winner one day!) And certainly, you have every right to dislike asters. I have to admit to liking them better when I could use “Aster” instead of “Symphyotrichum,” which takes a good deal of concentration to type properly. Ah, that lush cascades of flowers everywhere look you achieve so masterfully! Maybe I’ll get there one day, in a garden of my future. Thanks for sharing. Sorry to see your heptacodium is under attack. Ours in Pennsylvania had likewise suffered through progressive dieback and was on its last legs by the time we moved away. I think it would be nice as a snag for bird habitat, but I suspect the new owners have probably removed it by now. 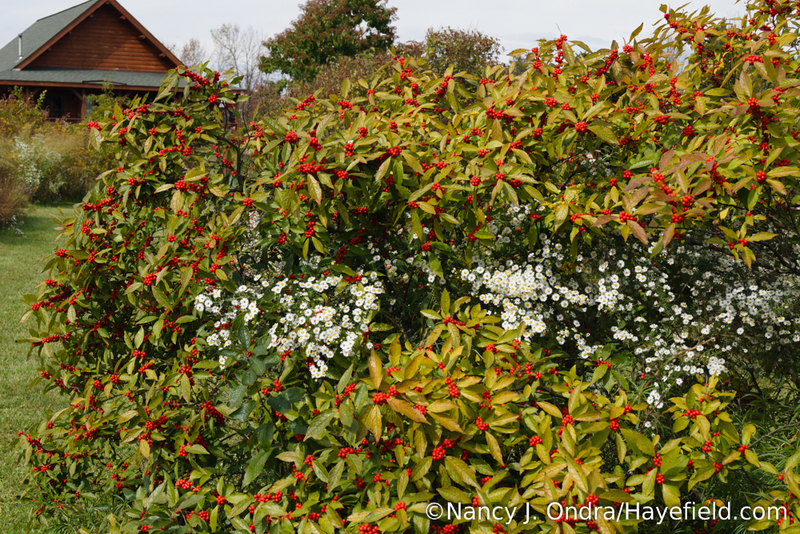 Happy Fall – may that first freeze push out by a good few more weeks! Hey there, Rob. 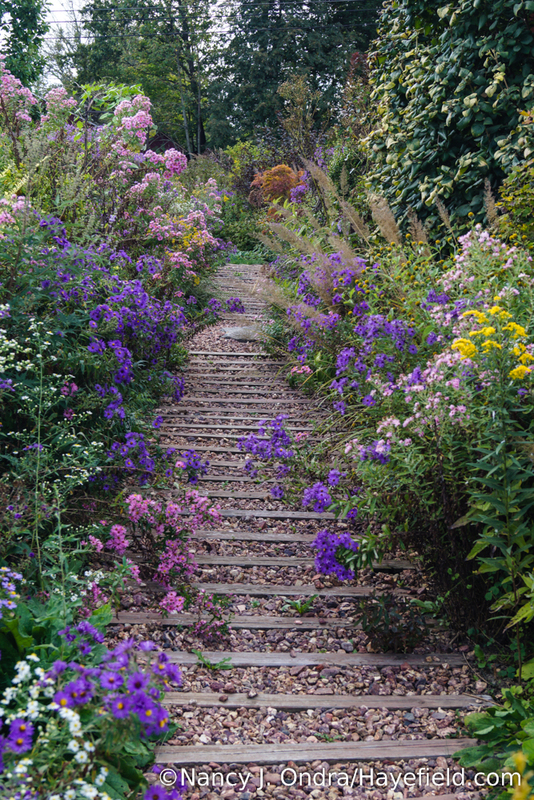 I have no doubt that you will achieve much beauty in your current garden, as you did when you lived up here. 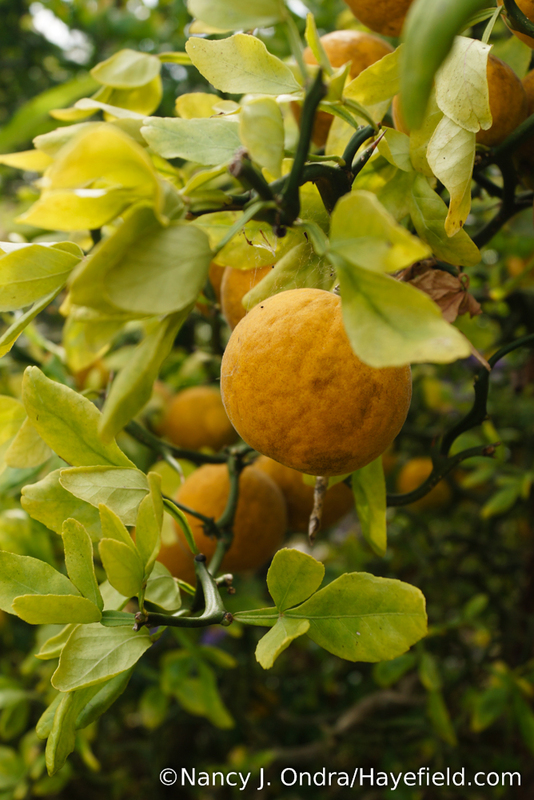 I envy you the many things you can grow in your warmer climate, as well as your extended growing season. It looks now like we might be flirting with frost tomorrow night. Time to start digging up the PA-tender things! Your garden looks wonderful, Nan! The asters bring so much brightness to this season. 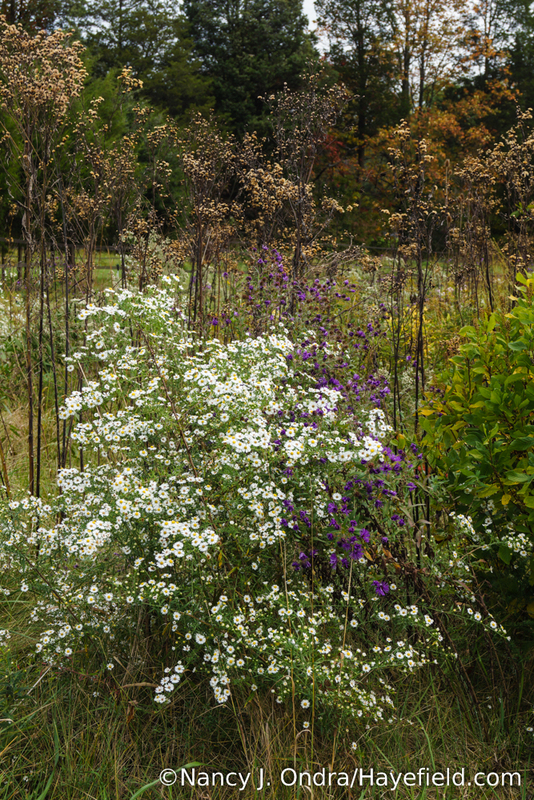 I have one enormous clump of a very tall purple aster (probably New England aster) that I really need to divide next spring and spread around. Your tussie-mussies and mini-bouquets are the best, if I lived nearby I’ve snap them up! Looking forward to your seed giveaway! It’s so easy to forget about dividing things, isn’t it? That’s one of my weak points when it comes to garden maintenance. Thanks for commenting on the crafty things. 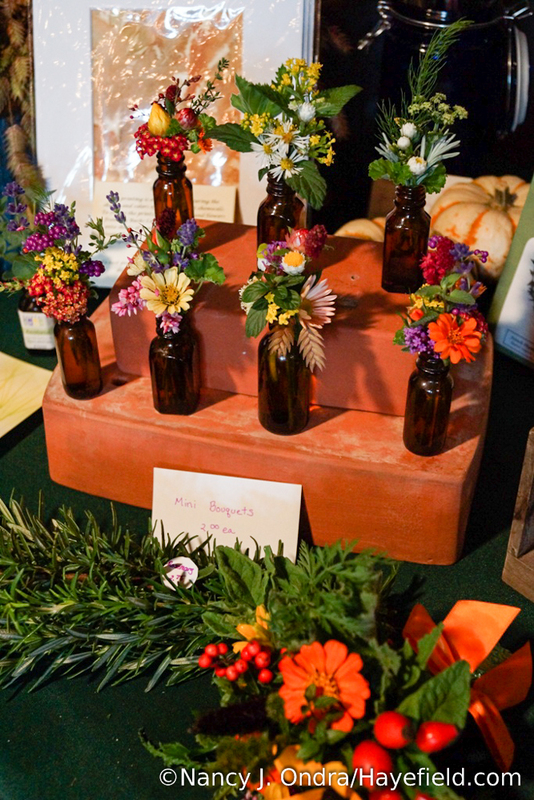 I’m happy to report that the mini-bouquets all found good homes, as did most of the tussie-mussies: got to keep just one for Mom and one for myself. Can’t wait to show off the seed list next month. I think it’ll be the biggest one yet. I hope you’ll find some new things you’d like to try. Any thoughts regarding the annual vines which sat in their pots and glared at me until finally getting going in late July? Not until a few weeks ago did the moon flower vines wake up. I’m with you, I don’t want to whine, BUT this autumn is just kind of ugly and brown. My thoughts would probably not be suitable for an all-ages audience, Jean. I suppose we can say that you’re lucky they got going when they did. Imagine my mixed feelings when I walked outside this morning to find the ‘Heavenly Blue’ morning glories *finally* in full flower, when we may be getting frost Monday night. 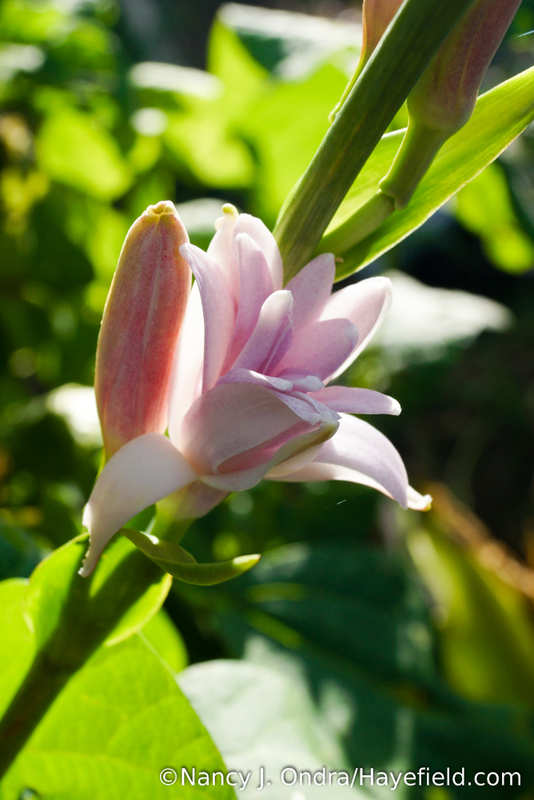 And the moonflower vines, which are so lush, have produced exactly two blooms to date. And…well, I’ll stop. We’ll just be grateful for whatever we get, right? And for the opportunity to try again next year. Always a pleasure to see what’s happening in your garden. I particularly like the fact that you show some wide shots as well as closeups. Really gives one a sense of the totality of the plants and of your garden. Thanks for checking in today, Linda. I appreciate you taking the time away from your own garden to read and comment. Here’s wishing you a glorious rest-of-the-autumn! 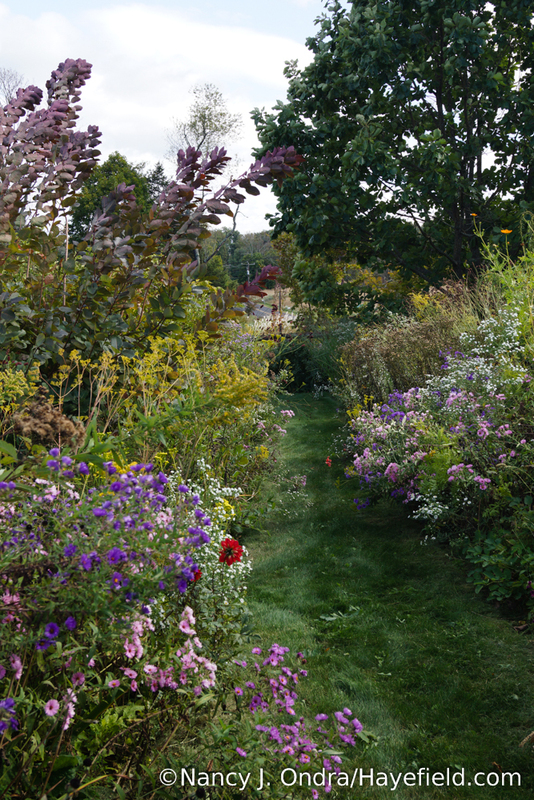 Every fall I look at your richly instructive pictures and ask myself why there’s no shrub border here. Though thanks be, I didn’t plant one in the last year, because there have been some loooong dry spells in the last year-plus. It was all I could do to keep the under-three-years-planted things going this summer and fall. I understand what makes asters seem weedy in some settings, but wouldn’t be without them here. Aromatic asters are at peak now, thankfully lightened in most spots by a tallish self-sown white aster that I still can’t ID. 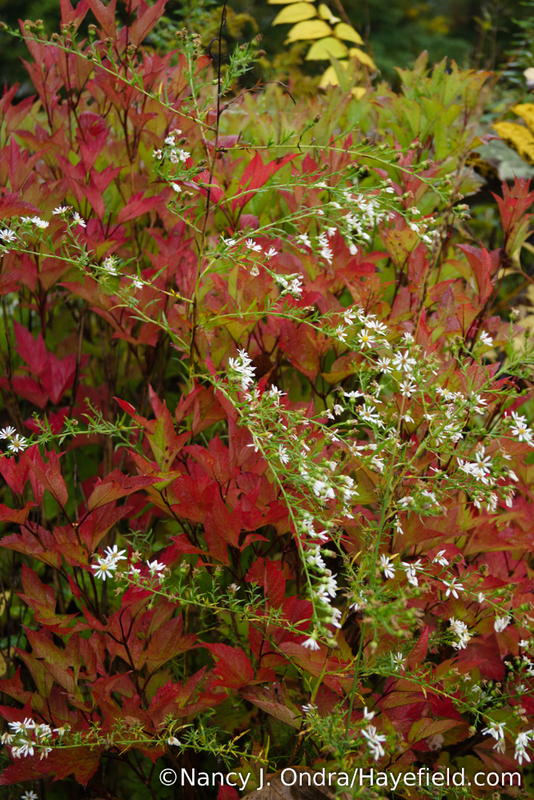 Could be a white form of smooth aster, or of S. puniceum (stems are dark-ish, more pronouncedly so on some). Bees seem to like it and the shrublike calico asters (S. lateriflorum) better than anything else in any season; both are *mobbed*. In the first image of the Hayefield aster path, what is the plant on the near right, with flat platelike (spent?) bloom heads? It’s at the rear left of the second image, taken from the other direction. Thanks for this regular dose of inspiration. Hi Nell! Wouldn’t it be great if we could order our needed rain online as easily as everything else? Or, maybe it wouldn’t be. Those white asters…I feel pretty confident identifying the ones in my garden and meadow if I’m right in front of them, but boy, it can be tough to make a definitive ID on the LWA’s if they’re mingled with other things at the back of a border, or in a photograph. These days, I have to think it doesn’t truly matter whether they’re this species or that one, as long as one is not trying to propagate and sell them. And you’re so right about the bees going crazy over them. There’s certainly no lack of honeybee activity here! The plant you asked about the the Aster Path photo is the post-bloom inflorescence of Hydrangea arborescens subsp. radiata. Best wishes for a happy birthday to Duncan! Hi Kris! I can’t help but think that whatever weather challenges I have to face here in PA, I have it much easier than you do. At least we can all look forward to having another try next year. In the meantime, may you be treated to some mild temperatures and a good soaking rain very soon. Wow, Nancy, you still have lots going on. Your asters are stunning and I like be the purple berry thing. 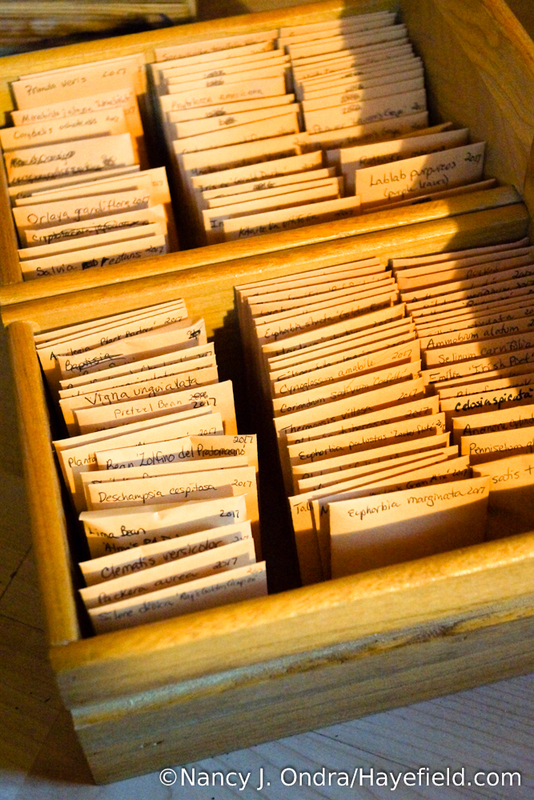 Some day, I want to have a seed library like yours. Happy gardening! Thanks for taking the tour today, Joanna. 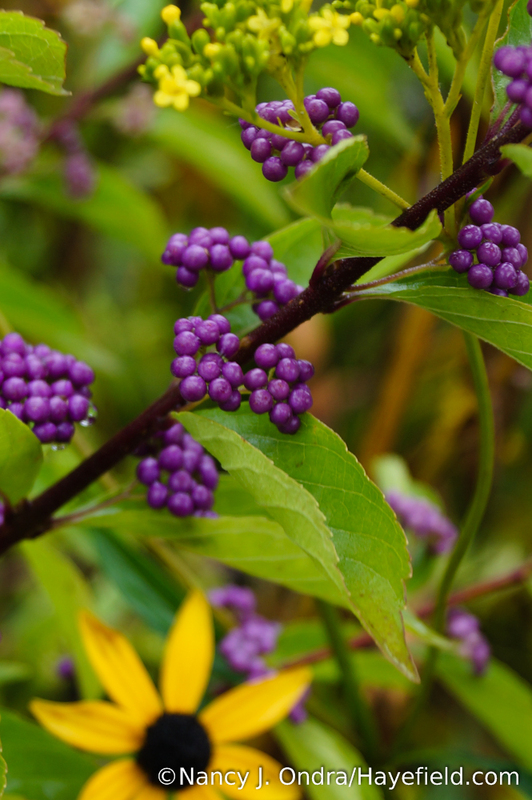 Yes, isn’t the color of that purple beautyberry fantastic? It’s hard to believe it’s real. Happy Bloom Day to you! Beautiful as usual and happy birthday to Duncan! I’m with you in having fingers crossed for no frost tomorrow night. I was just out there today taking cuttings of a few things and thinking it will be nice to have another week or so left to enjoy untouched tropicals, but then…..
Didn’t you mention you were playing around with a couple new corns this year? I hope you find the time for a few photos, even though it sounds like your plate is full enough with all the other things you have going on. 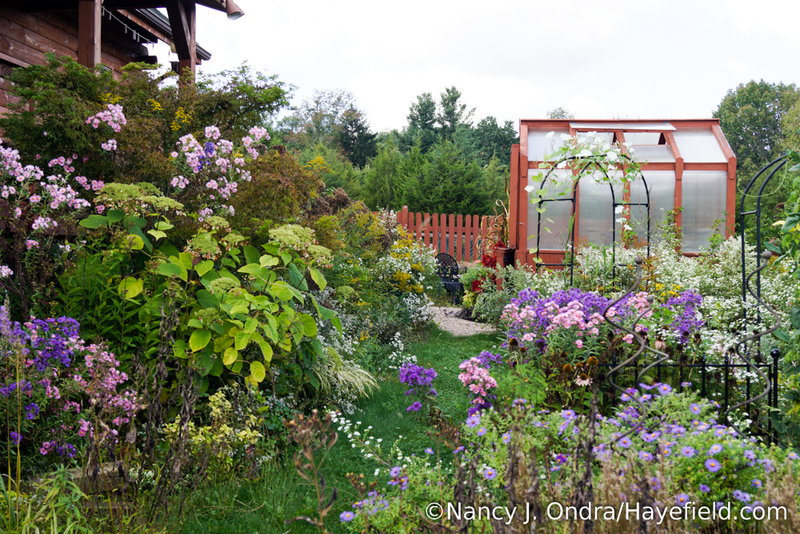 Can’t wait to see what’s on the seed list this fall, it really has been a nice year for gardeners, assuming you weren’t one of the ones waiting for the warm weather stuff to take off! Thanks from both of us, Frank. Yeah, I really should have spent today digging up the scented geraniums and tender bulbs but ended up making a start on cutting off the fluffy aster, Joe-Pye, and ironweed seedheads while the weather was still damp. I’m really not looking forward to hauling a lot of stuff into the basement, but I know I’ll feel guilty if I don’t. 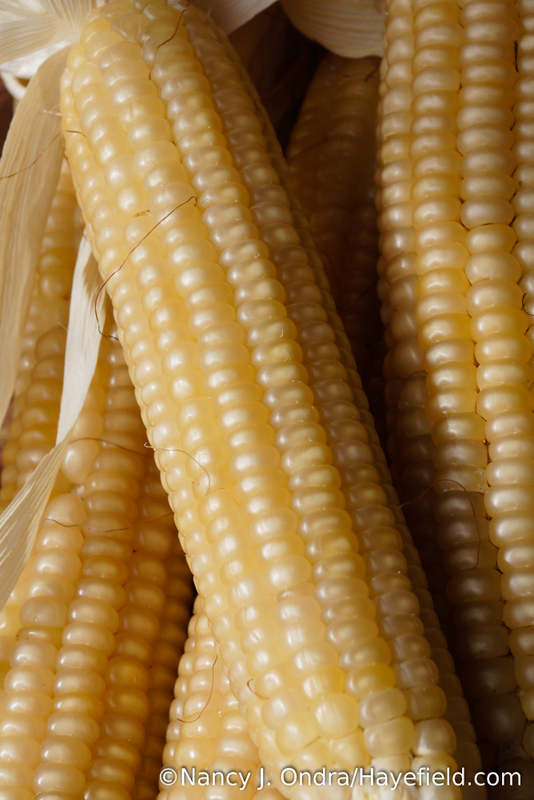 I ended up growing out only the Italian ‘Blancoperla’ corn this year in an effort to keep it as pure as possible before passing it along to an heirloom corn collector. I did do a lot of different and interesting Italian beans, though. 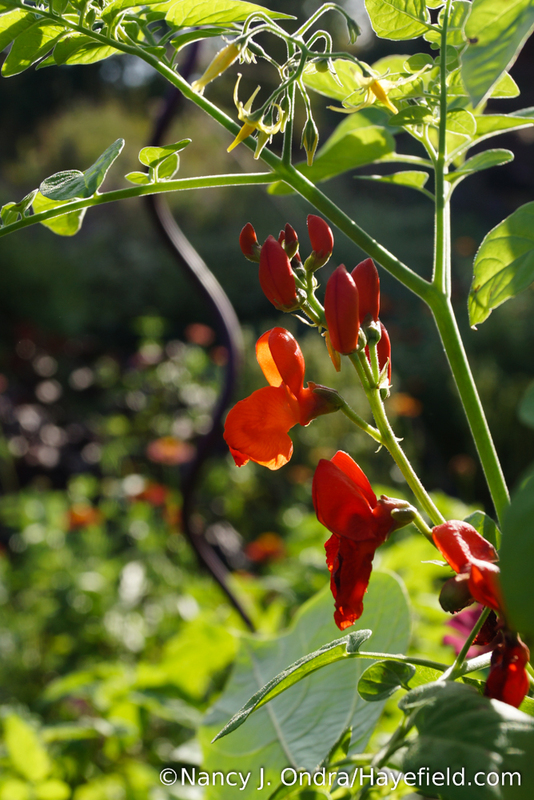 I hope you’ll find at least one or two edible or ornamental things of interest on this year’s seed list. By the way, I tried to leave a congratulatory comment on your post about the Eucomis seedling blooming, but stupid WordPress kept saying I had to sign in to comment and then seemed to think I was trying to access your dashboard. I wasn’t, honestly! 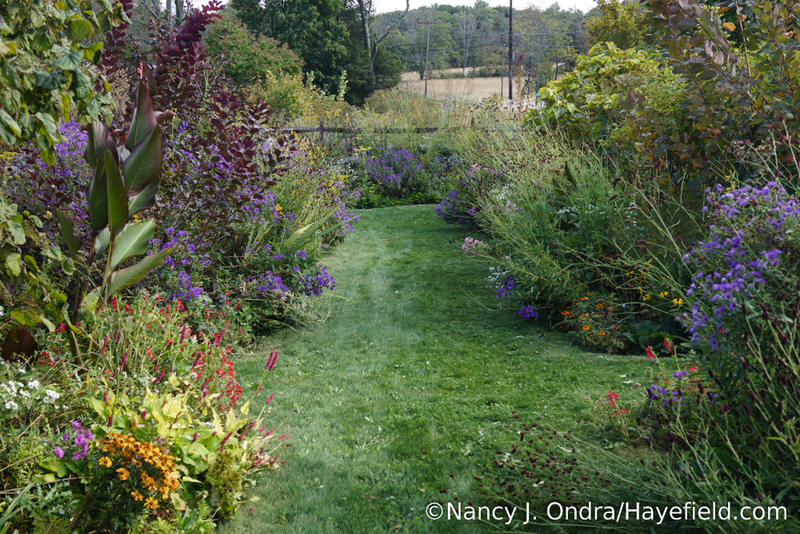 I love seeing your garden each month and especially love how your plantings spill out over the paths. I am not a big fan of Asters, maybe that’s because they don’t seem to like growing in my garden, except one, Aster Divaricatus, which I adore. 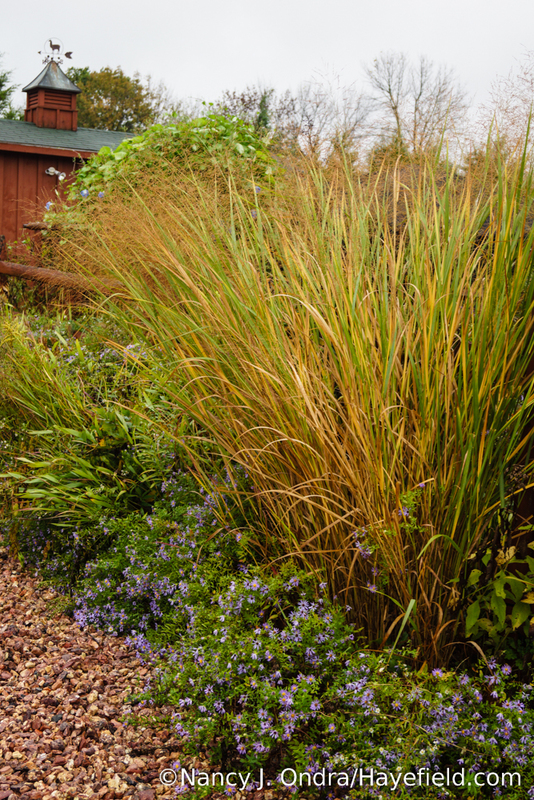 I am a big fan of grasses though, having quite a few planted, and enjoy seeing yours, my favourite is Calamagrostis brachytricha. Your floral arrangements are beautiful, so full of colour, hope they went well. Happy birthday Duncan, such a cutie. The cutie says thank you, Carolyn, and so do I. How interesting that you only have luck with Aster divaricatus; that one is common everywhere around here, except in my garden. 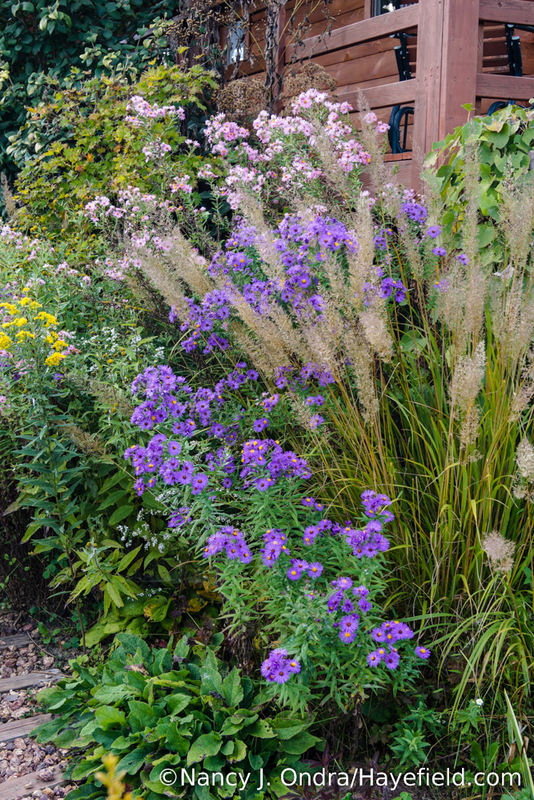 I agree that Calamagrostis brachytricha is a beauty, particularly mingling with dainty blooms. Hope you enjoy the rest of your fall season! Hey there, new fan here! I love how you use those volunteer little-white-asters! Your garden really is amazing. I’ve been devouring your back-catalog of posts. I recently purchased a house and am looking forward to installing a new garden (Zone 5b central Michigan), so I have marked my calendar for the seed giveaway! Welcome, Emma! I’m delighted to have you as a reader. Sounds like you definitely have a need for seeds. I’ll have lots of easy annuals as well as weird stuff to choose from, so you should be able to find a few things that’ll work for your new garden. How exciting for you to be at the start of a grand new adventure! What a pleasure to stroll thru your garden. So many beautiful things. East Tx. is dry and hot, can’t wait for fall to officially arrive. Thanks for your beautiful images. If only I could send you some our damp, cloudy weather, Jan, I surely would. May you and your garden get to enjoy some relief very soon. I appreciate you taking the time to visit today. Nan: I’ve been enjoying your posts and photos for a few years now, but never actually wrote a comment. You are truly an inspiration. 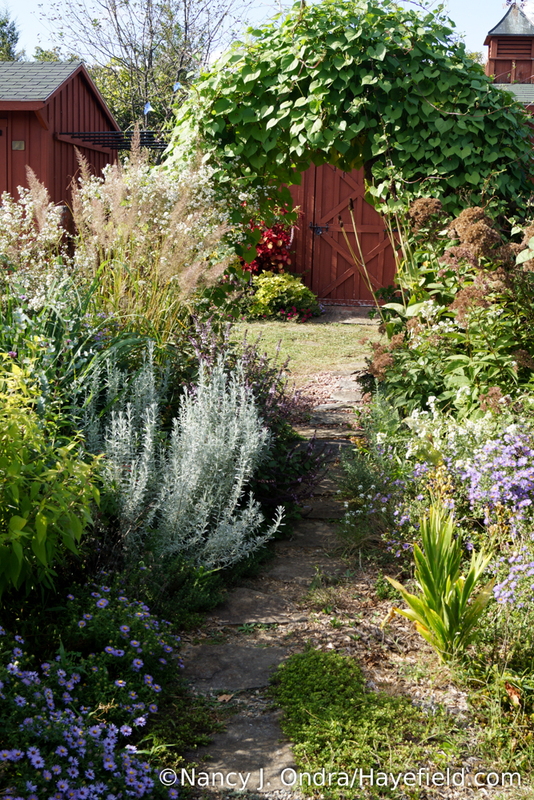 Whenever I see your amazing garden, I think of things I can add or move. I love that you use so many colors and variety of textures together. 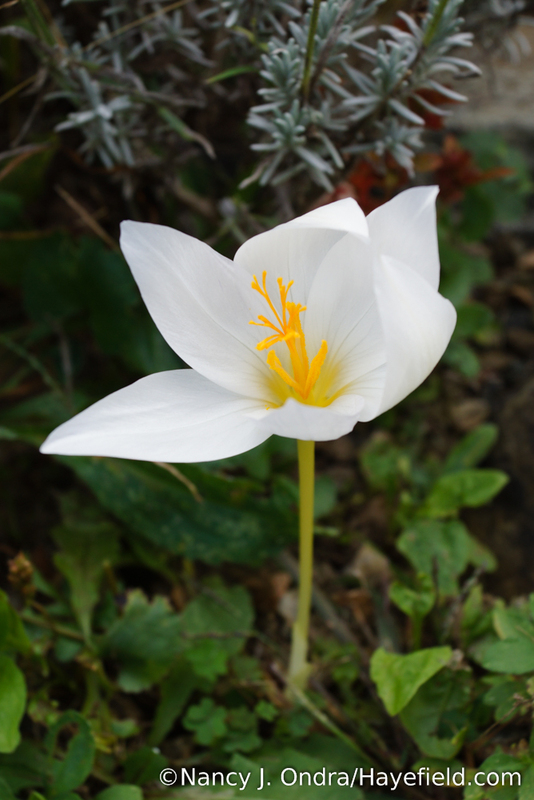 Your photos are always beautiful… You actually inspired me to start a blog of my own to record my own gardens. It’s not at all as spectacular as yours, but it’s been fun. The address is nancysnature.wordpress.com. Thank you for sharing your love of gardening. Happy Birthday to Duncan!! It’s a real pleasure to say hello to you, Nancy! Your comments made a good day into a terrific one. I’m so honored that I played some part in you starting a blog. I’ve heard people saying that blogging is basically dead–that people don’t want to read posts and prefer things like Instagram–but I haven’t yet seen any format that works so well for garden journaling. The ability to connect and share thoughts with other gardeners is a really nice bonus. 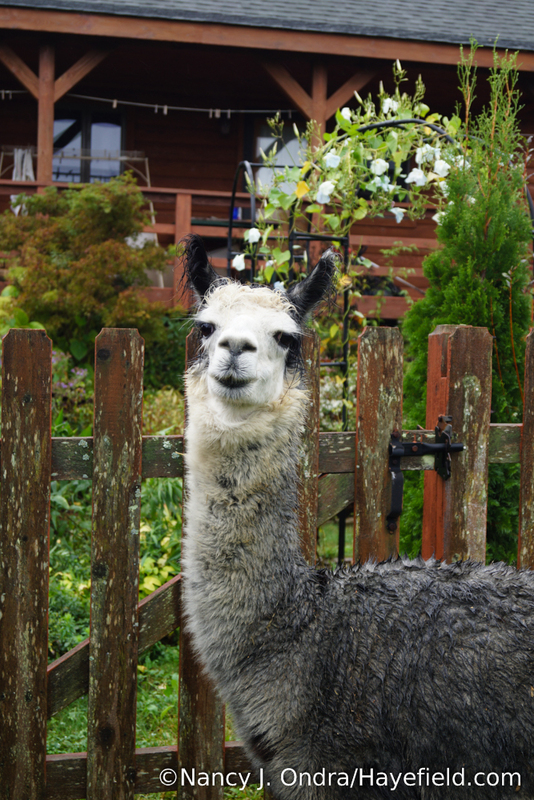 Happy blogging to you, and happy gardening too, from me and my fuzzy friend! 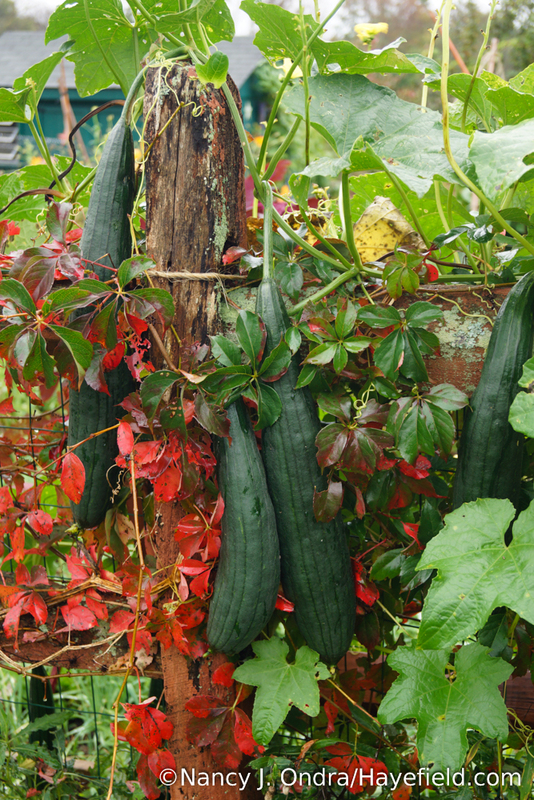 Nan, I really enjoyed your garden this month. I love the asters! I don’t have many as it is hard to make room for their mostly flopping habits. However, I intend to keep trying! I agree that the weather has been weird, even though we enjoyed a fairly wet summer. The rain dried up in mid September after Harvey and Irma came through. I haven’t noticed much fall color yet although trees are losing their leaves already. Again, it was sheer pleasure to visit your garden again and revel in the lovely annual climbers. I haven’t planted any in a couple of years but you can bet they are back on my radar! Hi Kate! I know what you mean about the asters flopping. I usually cut the New England types back by 1/2 to 2/3 around early June to encourage them to be bushier. 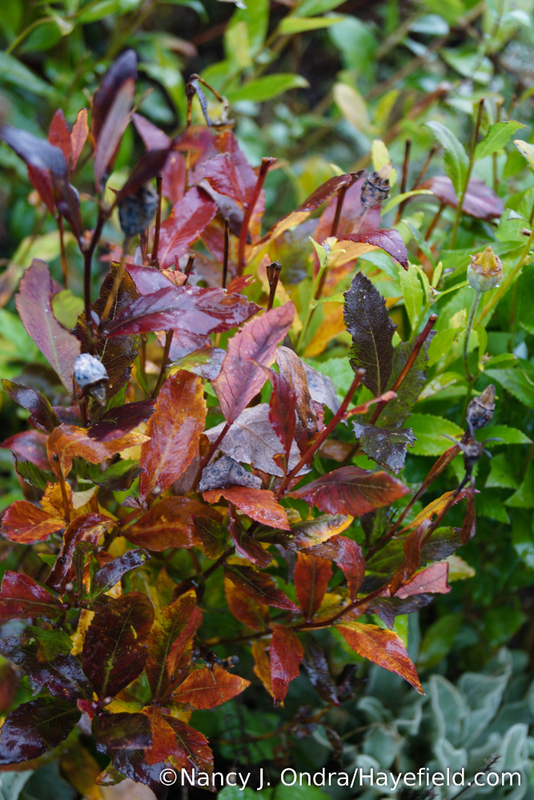 It also helps if there are low to medium-sized shrubs that they can lean on. It sounds like you’ve experienced the same weather conditions as we have here: a sudden stop in the rain for several weeks after it was so reliable all summer. 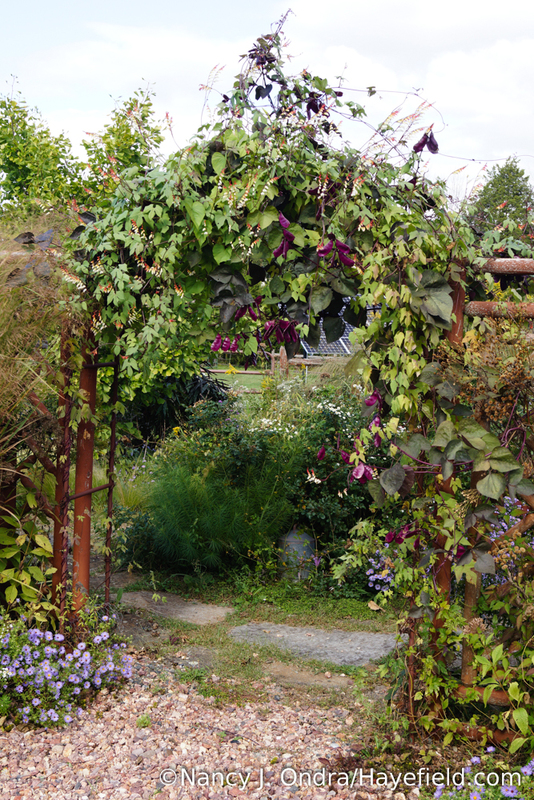 Looks like we ended up with a patchy light frost last night, but the morning glories made it through–hooray! 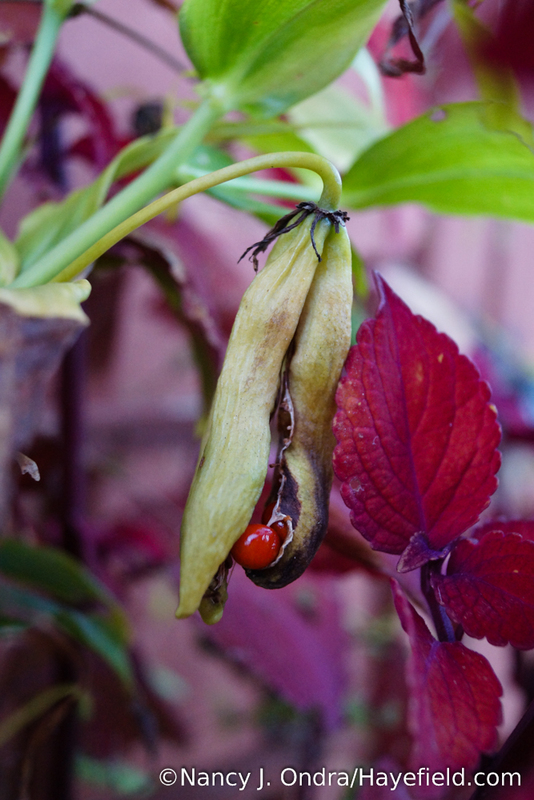 Now I’m impatiently waiting for the seeds to ripen…. Hi Nan!!! It’s always a pleasure reading your monthly post, especially because I always discover something new…for instance…today…Tridens flavus.!!! 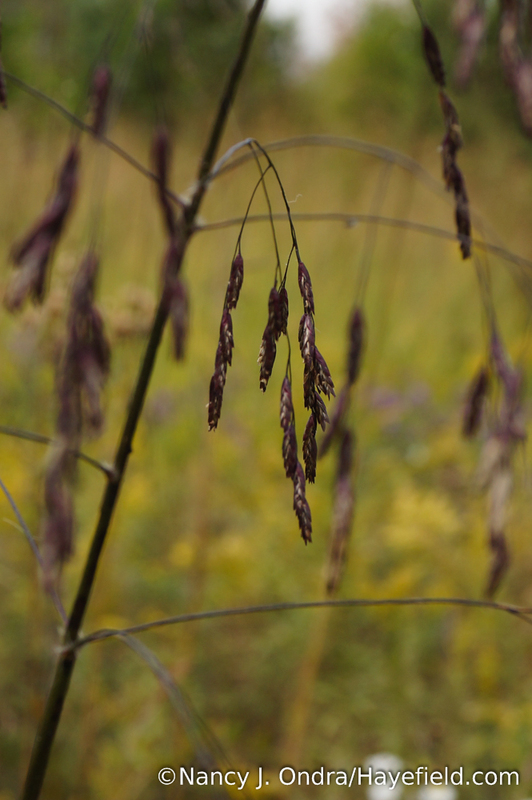 I am kind of obsessed with grasses (as Clark never forgets to remind me!!) and I didn’t know at all this one. 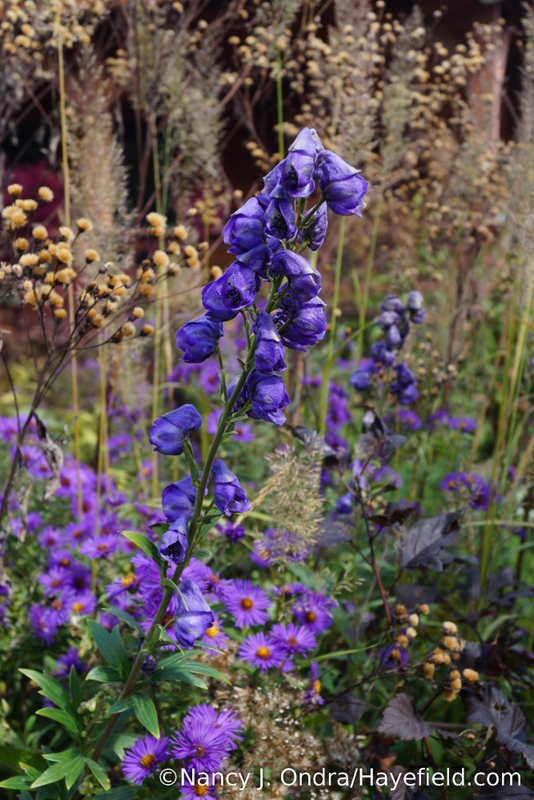 I love the purple colour and I think that planted en masses it’s a wonderful vision. Were you able to get some seeds? I would love to try it!! Thank you for sharing your wonderful garden and say happy birthday to Duncan!! Hey there, Rox! I will make sure I collect some of the Tridens seed this afternoon. 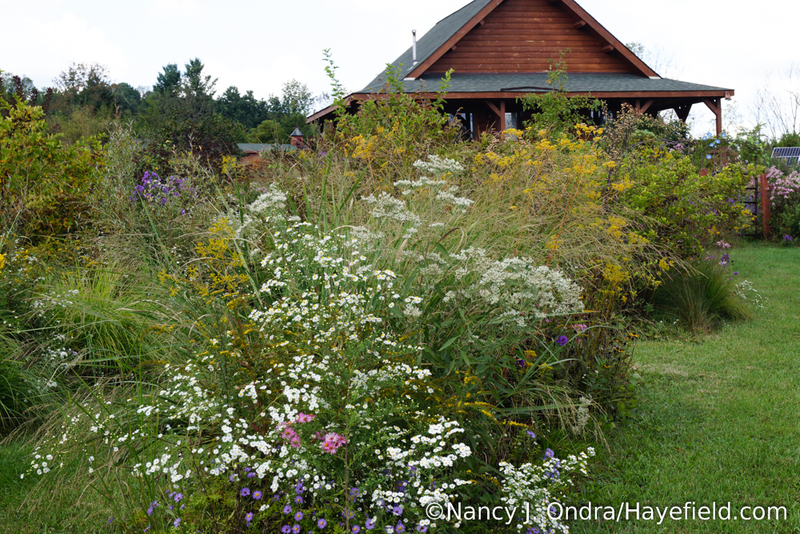 It grows wild here in my meadow and tends to be scattered among other plants. I agree that it could be very interesting in a large grouping. The yellow fall foliage color is nice too. Duncan says thank you for the birthday greetings. We’re headed out for a walk together to enjoy the first sunny day we’ve had in a week! Thanks once again for yet another beautiful round of photos and information. 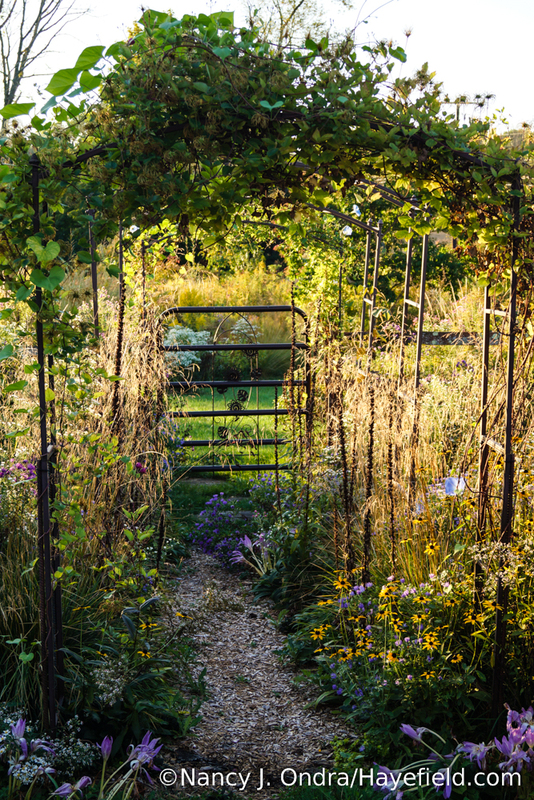 I am always so amazed at just how many pictures you take the time to put in a post, and it is such a great tour of your gardens. 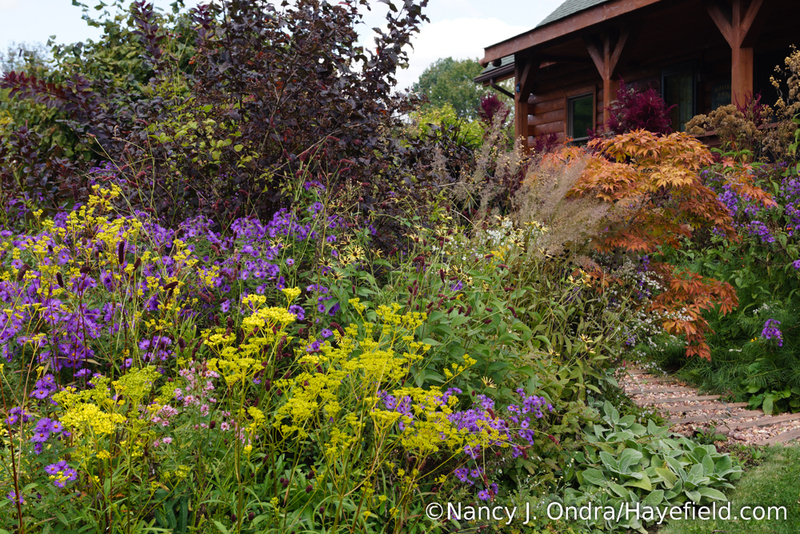 There are so many interesting things going on in your garden in every season, and you have a knack of sharing all the fun in your photos and dialog. Thanks for taking the time to share with us!! You’re welcome, Susan, and thank you in return for taking the time to read and comment. As much as I enjoy Bloom Day, I must admit that I’m looking forward to a winter break! Wow! Your gardens are fabulous. I just discovered your blog. 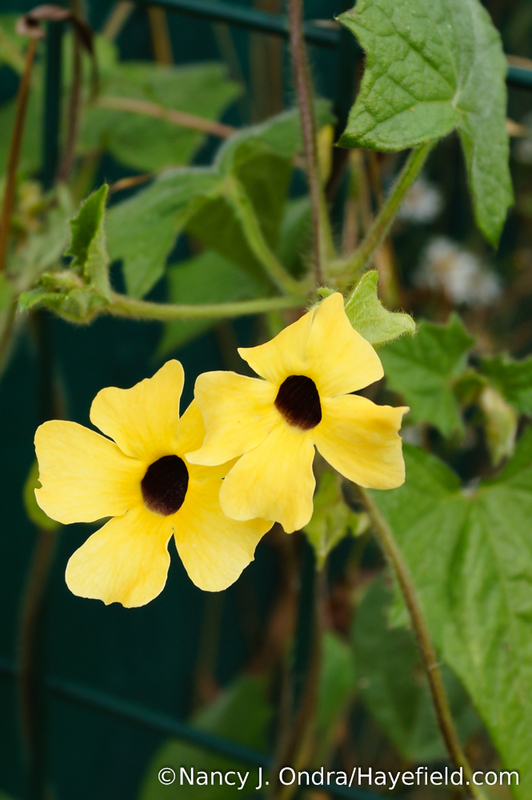 Thank you for introducing me to the Patrina, I have ordered seeds. Also, thank you for showing how wonderful asters are. I have such a hard time finding the tall New England varieties…you would think they have become extinct if you shop local nurseries. Such an underrated plant. I live in S.E. Pa too, and felt so at home when I saw your photos. You are a true inspiration. Thank you for all of it. It’s a pleasure to meet you, Lisa! Thank you for your kind comments. 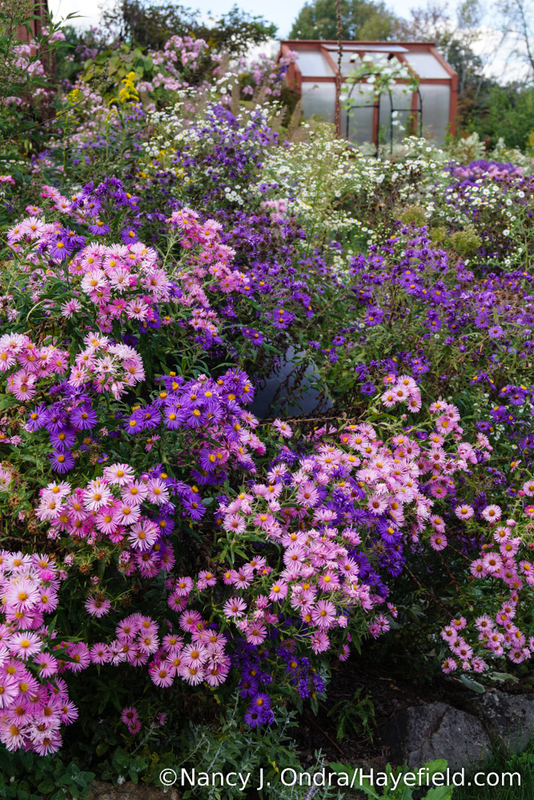 I completely agree with you about the New England asters being underappreciated. 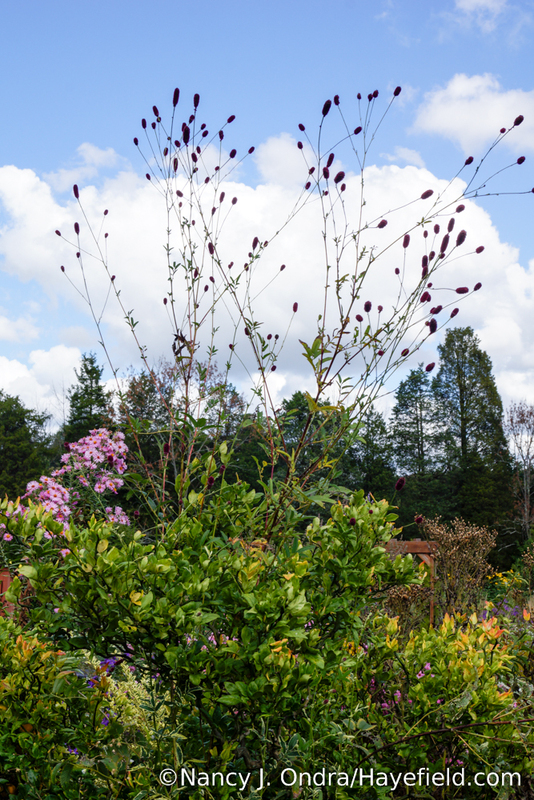 Granted, they tend to drop their lower leaves, but they’re so tall that it just makes sense to have a bushy perennial or small shrub in front of them anyway. I have collected seed from some of mine and will have it included in this month’s giveaway. I could have given you Patrinia seeds too! I just ordered some from your Etsy store. Also ordered copy of Foliage. 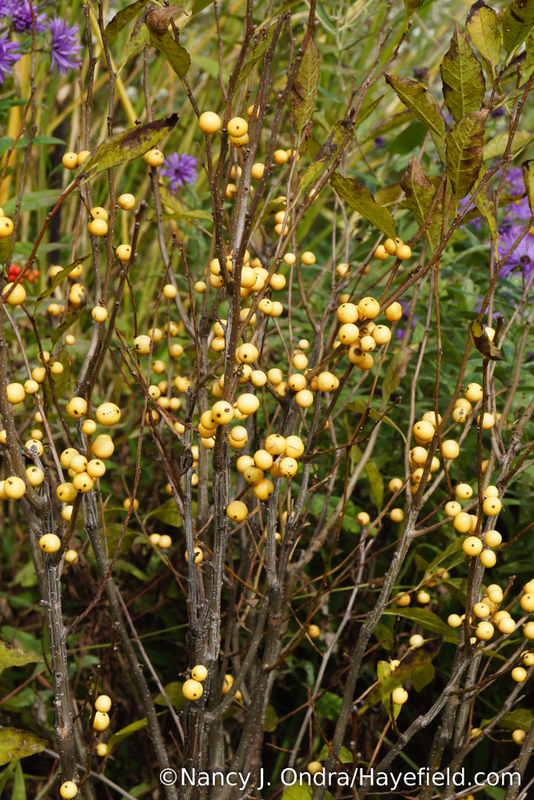 Is it best to start the Patrina seeds in the spring? I sent you a message about your seed order through Etsy, thanks. 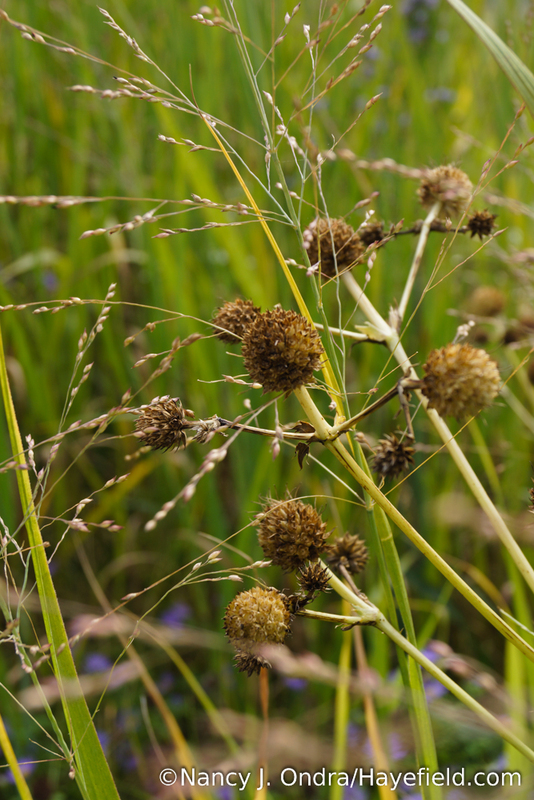 The Perennial Seed Germination Database at Tom Clothier’s Garden Walk and Talk suggests the following for Patrinia scabiosifolia: “Sow at -4 to +4ºC (24-39ºF) for 2-4 wks, then return to 20ºC (68ºF) for germination.” Another option would be to sow in pots in March, set them outside, and let them germinate when they are ready. I usually just let mine self-sow.